One of my very best friends is pregnant - someone with whom I went to preschool, Mother's Morning Out and Girl Scouts, and who I picked up every day for high school. She and her husband live in Kentucky now, and they're decorating an adorable baby-girl nursery. Two years ago, I made a bunch of little birds to decorate our wedding reception, and I based the pattern on these beautiful birds that Jessica had made for me. I thought they would make a perfect mobile for a nursery some day, even before Spool's showed up online (theirs is adorable, too). Since my friend will be hanging a sampler in her nursery, and since I've always wanted to use them for something, I used wooden embroidery hoops to perch my birdies on. Here is the simple pattern that I made to make these birds. I chose four different fabrics, and tried to coordinate them to the colors and fabrics in my friend's nursery. Sew each of the birds according to the pattern. I made three or four French knots for each of the eyes. When you've made eight birds, sew them onto the inner ring of a 10" and a 12" embroidery hoop. The birds likely won't sit up or look great; you're just trying to figure out the spacing right now. Cut three 30" lengths of monofilament (or one length and one double-length), and knot a loop at one end. Use crimp tubes to secure the knot on both sides. Mark the same length on each string, about 14" from the loop, in permanent marker. Wrap the string around the small embroidery loop, at the length marked on the string. Secure with a crimp bead. Tie the large ring on below the smaller one. Fiddle with both rings until you've gotten them both reasonably level. Then secure all your knots with crimp beads. Slide the large hoops onto the smaller hoops, and tighten to fit. Readjust the strings - they may need to be spaced unevenly around the hoops, depending on how your birds are spaced, in order to get the hoops level and well balanced. Once you're happy, secure the string placement with a staple. Now go back and sew each bird securely into place. The extra width afforded by the outer hoop will make it easier to get the birds to stand up straight. Done! Throw your friend a shower, and help decorate the nursery! This is so charming! Thanks for the adorable bird pattern! These mobiles are so darling for a nursery. I've made a few 'spool' birdies, but I really like the way the exposed edges make yours each look so unique. Thanks for the inspiration -- and great pictures! Just Stunning! Thanks for sharing. Brilliant! I made the Spool mobile for my now 18-month-old's nursery-- and had the darndest time trying to get the sticks to balance. This looks much easier to get right and I prefer the way it looks. Thanks for posting such a lovely idea! I really love this. This would be cute in any part of the house! Thank you for sharing! My sister has wanted a bird mobile for ages, but I haven't really liked any I've seen. Now I think I have found her birthday present. Thank you. Thanks, everyone! I'm definitely pleased with how it turned out. A word of warning: the birds take a little time to make, because you really have to hand-sew them, but it's mindless enough to do in front of a movie or Law and Order: SVU. As the recipient of this beautiful mobile, I have to agree that it is beautiful. We have hung it over the rocking chair in Ella's room and I know she will cherish it for years. Although she'll be unaware of it for years, I'll make sure she appreciates the time it took to hand-sew each bird. I had to drop another project to start on this immediately. Adorable. Thank you for posting this. I organized making this as baby shower craft activity for a small group of my girlfriends. They all loved just sitting around and doing this instead of games. Thanks so much! Anonymous - that is so nice, and it sounds like so much fun! What a lovely gift and keepsake for the mother to have. Thank you for telling me! Elizabeth: I just finished the mobile last night that we made at the baby shower. I used brown yard twine to cover the embroidery hoops. I even brought it into work so show co-workers and everyone loved it and has bookmarked this page. If you are interested, I can email you pictures. Since I didn't have any fabric scraps, I went to the thrift store and bought some fun coloured pillow cases, and lucked out by finding the embroidery hoops. My total cost of materials was $10! Again, thanks for the pattern. I really want to make this, but when I click on the link for the bird pattern it says URL not found...please help! I'm so sorry! That's totally my fault. I moved around the files on the server, completely forgetting about this! I've moved it back so they're back to working! I'm so glad you noticed and said something, thank you! I love this so much more than most traditional mobiles, adorable! Thanks for posting this beautiful project; I think I'll give it a try. This may be a silly question, but it seems like you need to make the french knot eyes before piecing the bird together. Is that right? Emily - I actually did the French knots at the very end. I just went through the head to do the second one. Poor little guys. Made a few minor modifications as you will see! Let me know what you think! My birds are not as nice as yours though! You have more patience and sewing skills than me! Its so cute, really lovely. The pattern has moved again! Can you please re-post it I would love to make these! Thanks! Sorry about that! The link is fixed! I LOVE this! The pattern seems to be missing. Would you please re-post? Thanks so much!! This is wonderful! Thank you so much for sharing. I am in the process of helping my sister put together an affordable nursery and building our own mobile will help a lot! (The one we had our eyes on was $144!). Great blog overall - new fan and follower here. Hope you can stop by decor-eat sometime soon. Cute. Where is the bird pattern? It doesn't come up when I click on the here link. Just takes to the same spot I was. Thanks. Hi! If you right-click on "Open Link in New Tab" or "Save Link As ... ," your browser should automatically download the PDF. Check your Downloads folder for bird_template.pdf. Maybe it is my inexperience but I can't seem to get the body parts to match up with the belly part...I see yours goes from beek to tail but the body seems to long for the belly part? can you give me some advise? I am trying to make this for a shower and it is not looking too good....yours is beautiful! ok I must be missing something....I am having a hard time stitching this bird together...can you give me some suggestions??? One person even said a group of people made these at a party! Is there a trick to getting the bigger body piece to fit the smaller belly piece? and any suggestions about size of stitches etc? Hey Suzanne! I'm so sorry it's taken me weeks to respond. The panel for the bird's belly doesn't actually go all the way to the tip of the tail. There's an inch or so at the tail that is ONLY made of the two side panels of the bird. The only place that all for panels of the bird should meet is at its beak. I hope that clarifies some. And sorry again for the late reply! Hi! 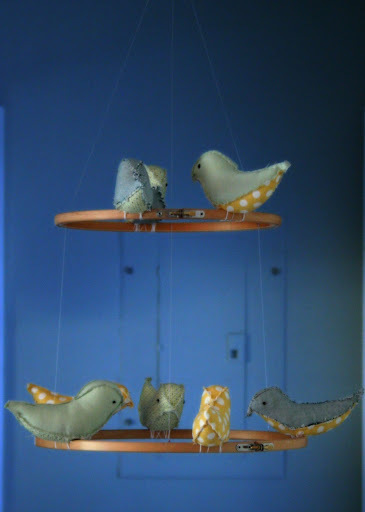 I love this bird mobile and am trying to make it for my sister-in-law. I had a question, though -- are the measurements for the monofilament based on a standard (8 foot) ceiling height? My brother's ceilings are 8.5 foot and I'm trying to decide if I should make the monofilament longer. Thanks! Hi! I'm not sure how tall my friend's ceilings are, so I think I was just guessing at the right length when I cut the monofilament. I also assumed that they might need a length of monofilament to hang to the ceiling, and then connect the mobile at the bottom of that. I wouldn't worry about it too much - as long as you don't make it too long, your brother can always attach it with a secondary length of monofilament. THANK YOU!!! This is EXACTLY what I was wishing I had the talent to "dream up"! Is there anyway to have a pattern to follow to make the birds? I love this idea, but I am such a novice sewer that I'm not sure if I could pull this off easily. I really wanna make this for a friend of mine that is expecting. Let me know if you have any thing that could help. Thank you! Hi Allison! I just recently made these again (for our own nursery!! ), and I think I make them a little bit differently every time. I tend to start with the beak, and eventually piece all the parts together until there's just one gap left, near the stomach or the back of the head. Then I push stuffing through the gap, and close it up. I've found that it's helpful to leave a wide seam while you're sewing, and then go back and trim off a tiny bit - the edges tend to get frayed when you're handling them a lot. Super helpful! Thank you Elizabeth. :-) If I'm able to pull this off, I'll try and post a picture. Amazing and wonderful article.Thanks for share.